Yesterday I stopped by the new Whole Foods and got a slap on the knuckles for taking this photo. 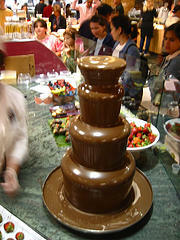 That's a fountain of melted chocolate used to dip strawberries at the confection counter. The berry-dipper told me, in bored terms like it's happened a hundred times already, that photos are prohibited unless you get a photo permit from the Customer Service booth. I was too miffed to inquire how hard it is to get a permit or what additional restrictions are associated with one. I may go back and do that another day. I did leave a comment card to the effect that if my eyeballs are permitted in the store, my camera should be as well. I hope other photobloggers will do the same, or better yet, just take the damn photos anyway. Photo-crankery aside, I can't say I had a good time in my short visit. The gridlock in the store was worse than Central Market the day before Thanksgiving and after sharing my thoughts with management I let myself be squirted out the door like a watermelon seed. I've never been a big Whole Foods fan. My true love is Wheatsville and I have a sinful thing going on the side with Central Market; next to them Whole Foods seems like the worst of both worlds. But I'm willing to believe that the new store might give CM a run for its money, if only I could fight my way back to the various departments to find out. Maybe I should try it on a Tuesday morning. Meanwhile I did get a couple of shots of some nice if self-serving exterior details.